A pendulum consisting of a mass fixed to the end of a (massless) rod can exhibit complicated motion when driven by an external force and with possible damping. 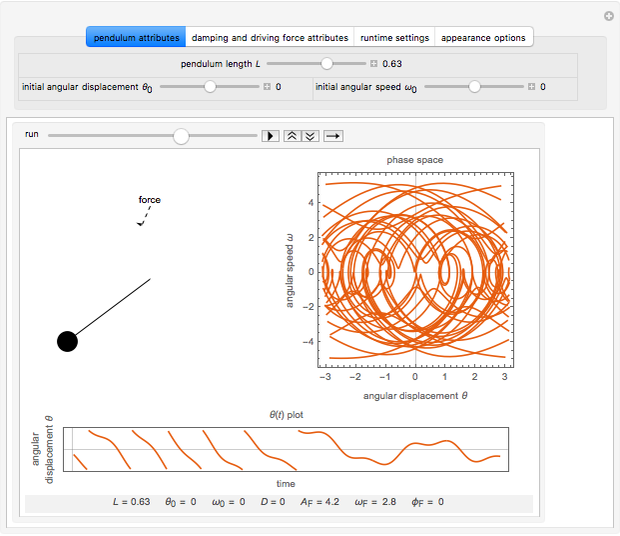 This Demonstration explores the range of resonant, transient and chaotic behavior that this simple system can exhibit. 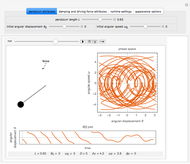 After selecting the various parameters, click the "run" arrow to set the pendulum in motion. Despite the apparent simplicity of a single pendulum driven by a sinusoidal angular force and possibly damped, several very different types of motion are exhibited, depending on the initial conditions and parameters of the system. 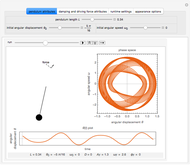 From simple harmonic motion (SHM) to decaying damped oscillations, and from driven resonance following transient motion to ever-changing chaotic motion, this system produces a remarkably diverse range of behaviors. Also of note is how small changes in initial conditions can propagate into vastly different behaviors due to the nonlinearity of the system; this is the distinctive feature of chaos. 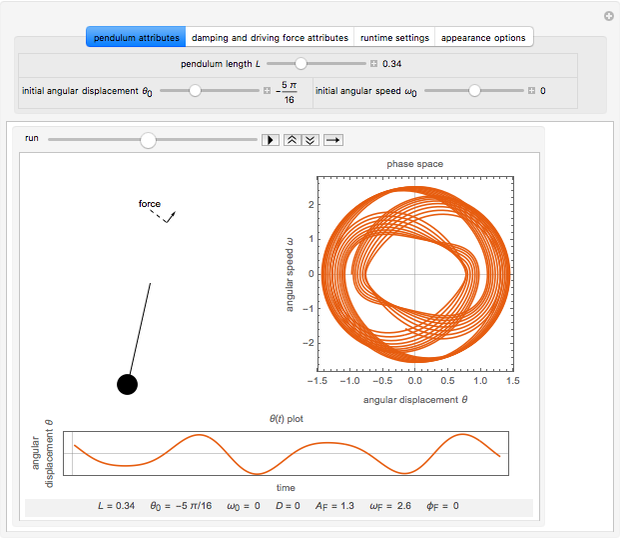 The phase space plot of angular displacement versus angular speed can be shown, along with the versus time plot to visually classify pendulum behavior. 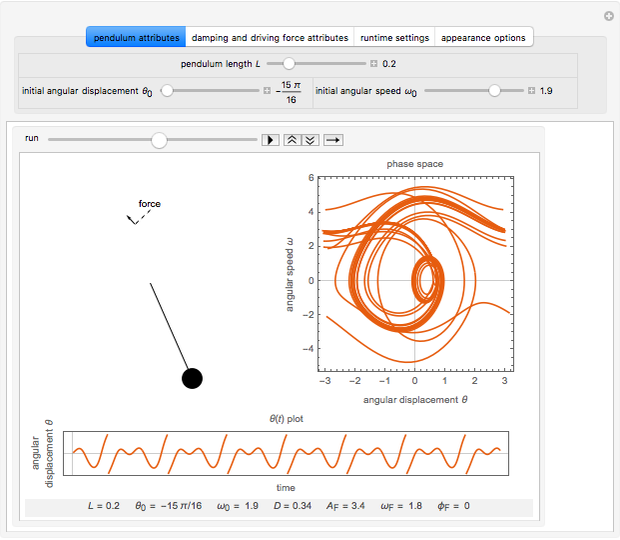 The plots are drawn in real time along with an animation of the physical system, and the time axis resolution can be changed to best display patterns in the motion. The Snapshots show a selection of possible motions. Note that the simulation can be precomputed or computed in real time. 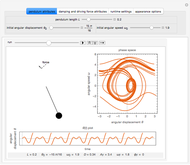 Real-time computation is only advantageous for use in instances when very large values of are reached (clipping of plots is reduced). Noah Hardwicke "The Pendulum: From Simple Harmonic Motion to Chaos"